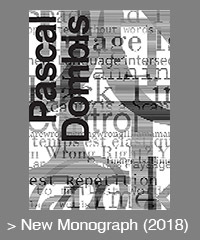 Pascal Dombis is a visual artist who explores such fields as language, noise, control, and irrationality. He creates unstable and dynamic visual environments and artworks, notable for the excess, repetition and unpredictability of technological processes. Didier Girard is an essayist, literary editor and currently Professor of European Literatures at the University Rabelais in Tours. Christine Buci-Glucksmann is a Paris based art philosopher. Kay Heymer is the Head of Modern Art of Düsseldorf Stiftung Museum Kunstpalast. Giancarlo Pagliasso is a Turin based italian curator, art critic and theorist. Patrick Amine is a Paris based curator, journalist and writer. Henri-François Debailleux is a Paris based art critic. Frank Popper is Professor Emeritus of Aesthetics and the Science of Art at the University of Paris VIII. He is the author of Origins and Development of Kinetic Art, Art of the Electronic Age and other influential works on art and technology. Joseph Nechvatal is a New York and Paris based artist and art theoretician. Blackhawk is a New York based critic and theorist involved with new media and digital art practice.